It was September 21 when I made this; the last day of summer. 4°C (39°F). Small wonder I was inspired to make a "coat" for my Kenmore... even it must have been cold! Kidding aside, I've known for a long time that it's a good idea to cover a sewing machine when it's not in use, to prevent dust from settling into all the various nooks and crannies. The very act of sewing — in and of itself — already creates dust, so having additional ultra fine dust added to the mix just by being exposed to the elements inside your dwelling is probably something to avoid. So have I ever covered my machine? No. My Kenmore comes with a rigid case that's essentially used for transporting it from one place to another. Without removing the top thread and various other "things" that I have in and around the machine, however, the cover is more or less useless. And if I have to dismantle and put stuff away in order to keep the dust off, well, let's just say that there's a darn good reason why this sewing machine hasn't been covered for the past five years: I couldn't be bothered. Okay, so maybe that's not a good reason... hence this project. 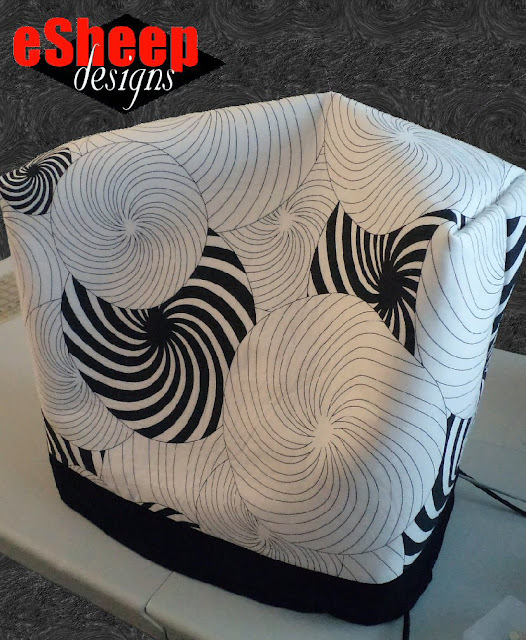 Of course, a decent amount of fabric is needed to pull off a sewing machine cover, so I immediately thought of repurposing my old black and white Ikea duvet cover. 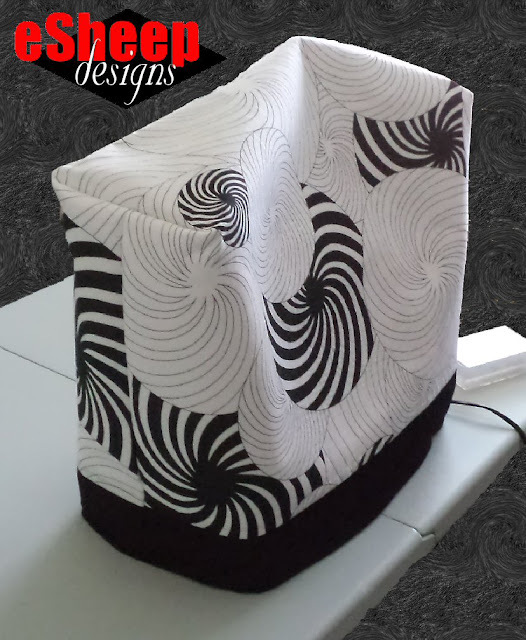 This fabric originally appeared on the first bag I ever made "from scratch"... the Make it Yours proof of concept bag. The $9.99 twin size duvet cover set came with a pillowcase that had a smaller version of the overall geometric circles print; that was what I harvested for the outside of the bag. What you see here comes from the actual duvet cover. It's not often that I get the chance to use something featuring a large print, and this one worked out even better in terms of the finished product because it's non-directional. Had I not wanted to add the black contrast band at the bottom, I could have just used one big piece of fabric for the entire exterior. In the above picture, the pointy part at the top of the cover is due to a thread cone still being in place on the spool pin. Couldn't have done that with my hard case cover. So how did I go about constructing this relatively simple item? After taking measurements for height, depth and width (using the rigid case cover shown below as a point of reference, but also accounting for the fact that I may keep a large spool of thread on top) and adding seam allowances to the equation, I arrived at a requirement for two 29" wide by 44" high pieces of fabric. My plan was simple: for each of the lining and exterior, I would fold the fabric in half (lengthwise, of course), sew together the two side seams and box the corners. Then I'd drop the lining inside the exterior and join the two by sewing up the top (or, the physical bottom ) seam. The fabric for the lining came from the pillow that I had ripped open in order to reuse the polyfill for my throw pillow projects. (So that pillow is now 99% recycled — yay!) However, by the time it was trimmed and squared up, it would only yield 28" by about 42". The pieced exterior fabric — the main fabric is trimmed at each end with black cotton twill measuring 5" x 28" — was interfaced with fusible fleece to add some body to the cover. The boxed corners at the top are 7" wide. To prevent the lining from separating and dropping away from the exterior, the corner pieces (that would normally be trimmed away) are attached to each with stitching as shown below. to secure the lining to the exterior fabric. It's probably hard to see here due to the black fabric, but my solution for the bottom (to address the matter of the lining being shorter than the exterior) involved folding the exterior fabric to the inside and then creating a rolled hem to trap the raw edge of the lining fabric inside. All that's left after pinning is to sew all the way around. A final stitch all the way around and it's done! Even with the concessions I had to make with the lining fabric, it fits perfectly. I can keep various tools (like my sewing light) attached to or on the machine and it's not an issue to cover it. Works for me! (And I've used it consistently in the weeks since, which is the main point.) I like that there are projects like this where you can just do it and not worry about perfection or preciseness. Is your sewing machine covered when not in use? Did you make the cover? If so, did you just wing it or use a pattern? I did use a pattern for the construction of my machine and serger covers, but I did applique on the front and back of the covers to make them more fun! My poor machine is covered with a pillowcase just thrown on top, if it's lucky. More often than not, I leave it uncovered. 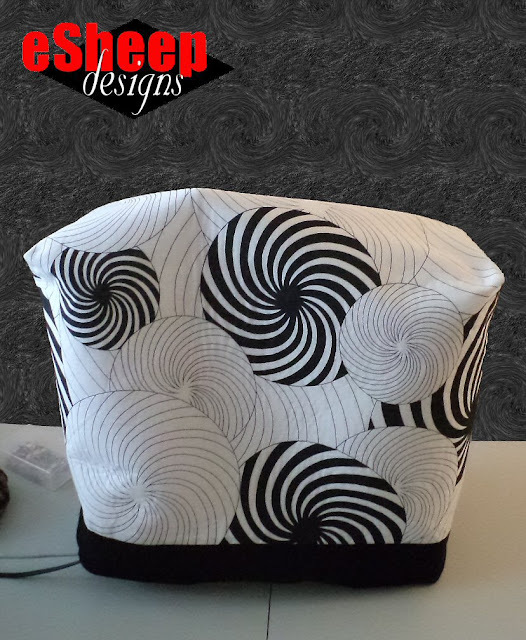 Love that black and white fabric.